1. A 50% deposit of the total room cost including taxes is required to secure your reservation. Once the booking has been processed, you will receive a Reservation Confirmation email that outlines a summary of your booking. Please review the information carefully and contact us immediately at info@hoteldegletscher.it if you have any questions or require any changes. 2. Please review our Cancellation Policy below. Securing your reservation with a credit card means you accept the terms of our Cancellation Policy. 3. The remaining balance of your total room cost including taxes is due on check in at the hotel. 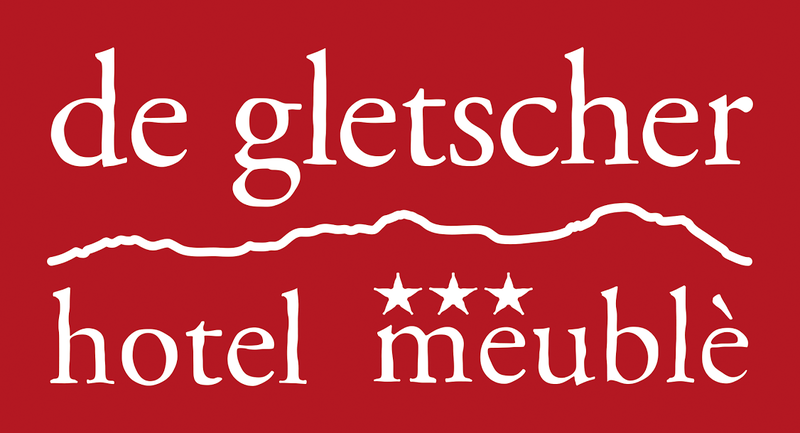 Hotel De Gletscher (HDG) accepts cash (Euro) and credit card (Visa, Master Card). Traveler’s checks are no longer accepted at HDG, you may pay your hotel room balance via bank wire transfer prior to your arrival. Please contact us at info@hoteldegletscher.it if you would like us to send you bank account details and wire transfer instructions. Payments must be received no less than one week prior to your arrival date. Please ensure you confirm your payment with us via email. 4. Pets are not permitted at HDG. Please accept this. 1. Securing a reservation with your deposit means you accept the terms and conditions of our Cancellation Policy. 2. Cancellations made more than 60 days from check-in date will receive a 90% refund of the deposit paid or the option of a credit, which is valid for one year from cancellation date. 3. Cancellations made between 60 and 31 days from check-in date will receive a 50% refund of the deposit paid or the option of a credit, which is valid for one year from the cancellation date. 4. Cancellations made less than 31 from the check-in date will forfeit the deposit paid. 5. We will issue refunds by bank transfer at this time. 6. We do not issue refunds or credits for flight cancellations, due to any circumstances. Please take out Travel Insurance to protect against flight cancellations. 7. There are no refunds or credits issued for reservation changes within 30 days of the arrival date that reduce the number of nights stayed. 8. There are no refunds or credits issued for early checkouts. 9. There are no refunds or credits issued due to bad weather; including any inconvenience or complication caused by a meteo events. Please take out Travel Insurance to protect against these types of unforeseen events. 10. HDG is not liable for any other costs, evacuation or inconveniences caused by bad weather. 11. All credits issued are valid for one year from the original cancellation date. A credit can be transferred to another person provided we have written authorization from you. 2. Any delays or cancellations. In the event of a traveler becoming ill during a vacation, or having to cut their vacation short, all hospital and medical expenses are the traveler's responsibility. 3. Monetary crises, social unrest, political or labor problems, economic changes, electrical outages due to weather, mechanical maintenance or construction difficulties, for any claims, losses, damages, costs, expenses, delays or loss of enjoyment, of any nature or kind whatsoever resulting from events beyond our or a supplier's reasonable control, including but not limited to acts of Nature, flight cancellations or changes, strikes, labor disputes, lockouts, threats or acts of terrorism, acts of war or declared war, weather conditions, diseases or epidemics/pandemics, novel or unexpected conditions and local laws. 4. Loss of items that are not secured in the hotel safe, or for losses incurred when rooms are not locked.